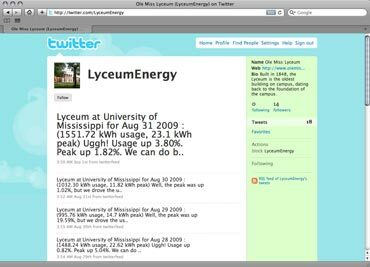 The University of Mississippi is looking to reduce power consumption in its campus buildings, and, as a component of the effort, it's going to be making its progress public in real time through popular social media outlets. The university is also churning out energy usage statistics through RSS feeds. Ole Miss has so far deployed 16 of the SmartMeters and will deploy more in the future, according to SmartSynch. The aim, according to the company, is to help the university "identify a detailed pattern of electricity usage at its buildings and, using the smart meter data, determine methods to alter behavior to reduce electricity consumption and carbon emissions." It's all a part of the University of Mississippi's "Red, Blue, and Green" campaign, an effort of the Office of Campus Sustainability aimed at integrating sustainability concepts throughout all areas of operation on the campus and at collaborating with colleges, schools, and departments on green education and research. "Being environmentally responsible is an integral part of the Ole Miss culture and having SmartSynch on board with our sustainability efforts by supplying its SmartMeters significantly strengthens our ability to optimize our operational efficiency," said Jim Morrison, director of strategic planning and campus sustainability coordinator at the University of Mississippi, in a prepared statement. "We look forward to expanding our partnership with SmartSynch as we continue to roll out its SmartMeters on campus." The University of Mississippi serves more than 17,000 students throughout all of its campuses, including those at the University of Mississippi Medical Center. Further information about the university's green efforts can be found here.